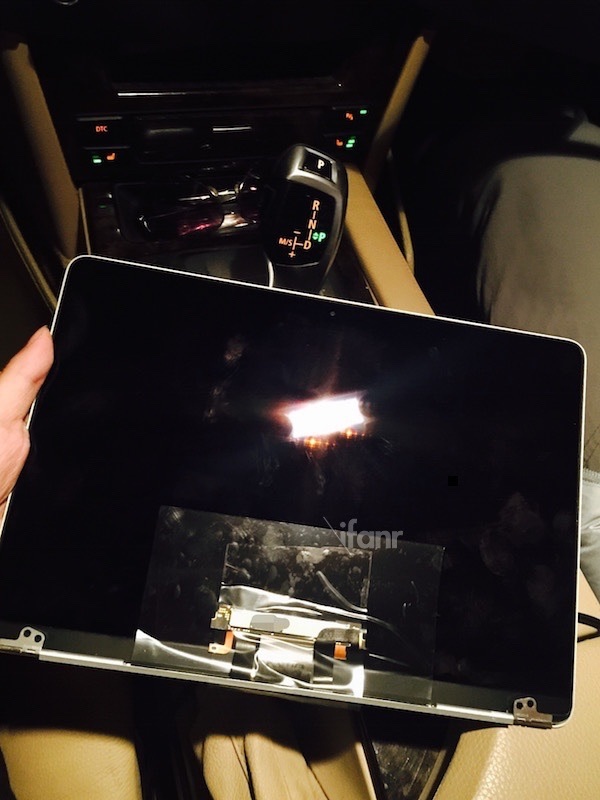 Just days after a report claiming Apple supplier Quanta Computer has begun ramping up production of the upcoming 12-inch MacBook Air, Chinese site iFanr shares some photos [Google Translate] of what it says is the display assembly for the machine (via SlashGear). 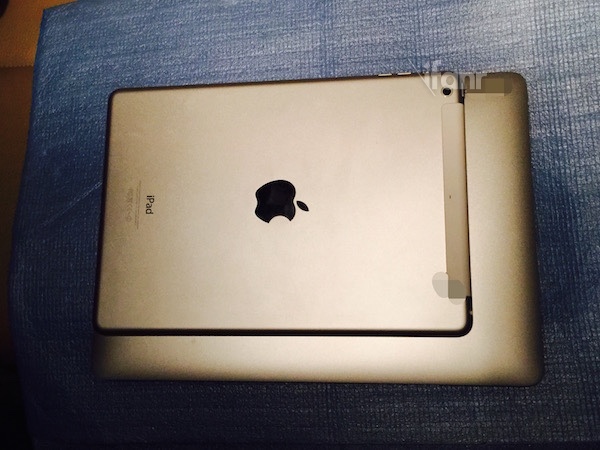 The photos depict the claimed display and metal shell from the upcoming 12-inch machine alongside both a 13-inch MacBook Pro and a 9.7-inch iPad, with its sizing appearing to measure up to previously reported dimensions. The display does, however, have two noticeable differences from current MacBook Air. 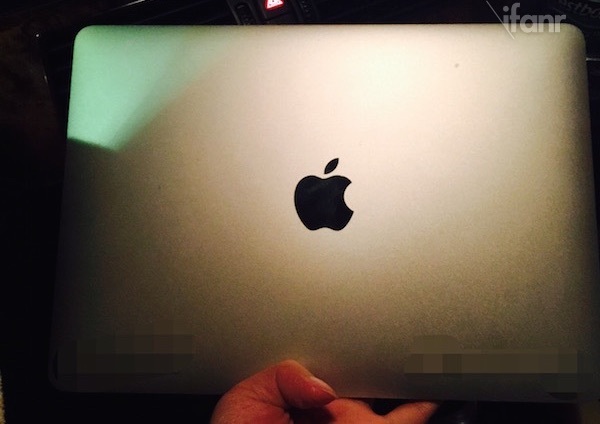 First, instead of a backlit Apple logo on the back of the display assembly as is typically seen on Apple's notebooks, there is a polished metal logo more like those seen on iPads, with iFanr speculating the change could be tied to the device's thinness. Additionally, the display lacks the grey bezels current MacBook Air models have, instead opting for an apparently all-glass edge-to-edge cover for the display as seen on Retina MacBook Pro models. Paired with black bezels underneath, it is difficult to see where the display ends and the bezels begin unless the screen is turned on. Earlier renderings of the 12-inch MacBook Air based on information from within Apple had shown gray bezels similar to those seen on the current MacBook Air. 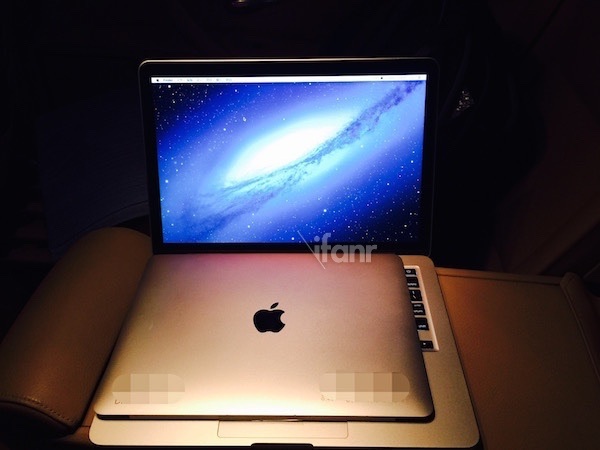 The next-generation MacBook Air is expected to feature a high-resolution display (perhaps classified as Retina) and new Broadwell Core M processors that will enable a thin, fanless design. Other reports have claimed the 12-inch MacBook Air will do away with nearly all the ports typically found on Apple's line of MacBooks, offering only a headphone jack, a pair of microphones, and a USB Type-C port that may handle both charging and external connectivity. No backlit Apple logo? NOT COOL APPLE! Less SD card slots than a Macbook Air. Lame. Strange way of saying No SD card slot. Would it have killed them to take photos of the ports?????? They only have this one part, the display. No Thunderbolt. Less SD card slots than a Macbook Air. Lame. Edit: for those of you that missed the reference, I'm riffing off of Slashdot's infamous dismissal of the original iPod (http://slashdot.org/story/01/10/23/1816257/apple-releases-ipod). How could Apple POSSIBLY offer a Mac that compromises on ports?? I know SOME people want maximum portability and simplicity, but not everyone has the same goals. So the only way this alleged model would make any sense is if Apple ALSO offers other laptops that meet the needs of people who need tons of wired peripherals and more speed. They could call them "MacBook Pros" or something. This is innovation? Meanwhile in other tech news, Google is working on driverless cars and CP3 robots, and Microsoft is working to covert our lives into a holographic minority report world that aims to blow your minds. Apple should NEVER make evolutions to existing products. ONLY revolutionary new things should ever be released. And products that actually ship don't matter. Products like holo goggles and robot cars that are NOT shipping--and may never? Those are what matters! We all know Apple has nothing in the labs. If they did, they'd be making "what if" videos for what might happen someday! Oh, well. I reckon the 12" retina screens are for this and not an iPad Pro. Don't think an iPad pro even exists. I'm calling it now. The next gen MB Pros are gonna come in 14" and 16". I needs it in gold real bad.